Dreamtek recently broadcasted a live interview with Lawson the popular English pop band on a Google+ Hangout. The reason we chose a Google+ Hangout is because it’s a reliable platform to broadcast live in HD on Google+, YouTube, and your website. Its also recorded and automatically saved on your YouTube channel for your subscribers to watch back at their leisure. Another great feature we used is the Google+ Hangout ‘Live Conversations’. We used this to take questions from Lawson’s fan base in advance of the interview. We then selected the most popular ones to ask in the live Hangout. It was a great way to involve the audience and interact with them before and during the hangout. In total we had 572 viewers watching the live broadcast, and the numbers keep going up on our recorded version on the Dreamtek YouTube channel, we couldn’t be happier with the outcome and want to thank all the fans for getting involved. Check out our latest Dreamtek guide to creating video content for events, why should video be part of your marketing strategy and how to plan the creation of your video content. Determine goals – SEO, branding, lead generation and social media. Why is video an important part of your digital marketing strategy? If you have something to say, you need people to listen, and the people listening most these days are watching video online. You really can’t afford not be getting into video, so whether you are starting out or are already experienced our guide to video creation can help you think about some of the things you need to plan when creating video for events. Broadcast your event live on YouTube via Google+ Hangouts FOR FREE! Dreamtek have worked with leading brands and celebrities like the BBC Teen Awards, Bastille, Jamie Oliver, Toni & Guy and Google to produce professional Google Hangouts so now we are offering one lucky winner* the chance to get a free Google Hangout filmed with a 4 multi-camera set up and streamed live. You can even invite people from around the world to interact with the event via Google Hangouts. We are looking for anyone who is running a cool event to tell us what’s great about the event and different – who is your event audience and how you could benefit from the live stream of the event we film for you. It could be a music event, launch event, festival, exhibition or sports event, let your imagination go wild. Simply enter the details of your event/gig/conference and your contact details to stand the chance of winning a free multi cam stream of your live event. *The winning entry will be professionally filmed with a 4 multi-camera set up by Dreamtek and live streamed on our Dreamtek YouTube Channel. Full Terms and Conditions available here. Video asset management? Surely that’s not a problem? In truth of course while it’s never a problem when you begin creating video assets, it quickly becomes one as your project or projects develop. That’s because the more work you create the faster you gather huge quantities of video assets, some of which may be useful in current or future projects. Fine, but do you really have time to look through these assets in real-time, searching for the moment you need? You probably don’t: That’s why we developed VF Hub, our bespoke end-to-end video management system. We’ve built VF Hub (Mac or PC) to be super-easy to use. A simple user interface combined with our ability to develop the software with the look, feel and feature-set you and/or your company most need make this a useful companion tool for any video project. This is probably why the software’s already in use across a range of big organisations. We also include it within our innovative Broadcastpod solution. Naturally our solution isn’t confined to asset management. VF Hub provides a range of features: Media publishing, review and approve, playback, export and editing tools are included. The intention is that everyone involved in your enterprise’s project can use VF Hub, which acts as a central location for authors to upload content, editors to manage, review and control distribution of content and for production staff to export markers into editing suites like Adobe Premier Pro. 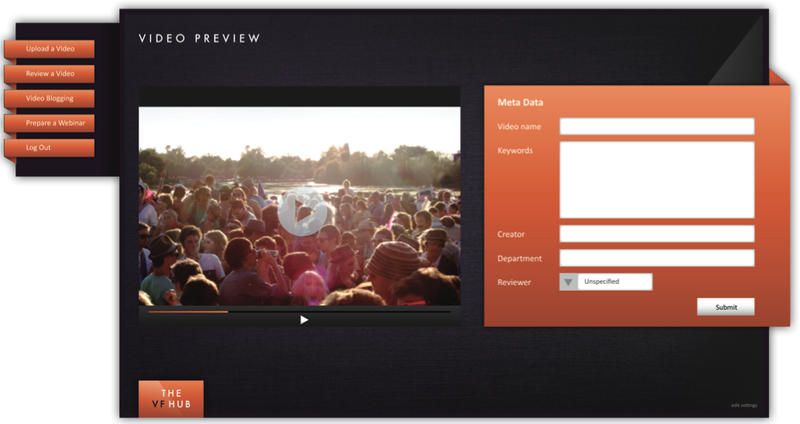 It acts as a central hub for video assets. As you add clips to the central pool it’s easy to add relevant metadata designed to make these assets easy to search when seeking an appropriate clip. Our solution’s not confined to video. We also deployed it within a company-wide eLearning solution for Peugeot, partly because of its ability to take PowerPoint slides (converted through Adobe Presenter) in order to convert them into webinars. There’s three main features to the Hub: The Presenter, the Player and Mesh. The Presenter works a little like PowerPoint and enables presenters to play slides and video clips in a similar way. It also enables users to capture and save all movements through the slides in order to create a repeatable online presentation. Our secure, cloud-based Presenter offers digital asset management of all video assets and a range of automated playback options. The Player is a video on demand player through which you can playback your assets in sync with each other. The customizable interface is designed for fast and easy playback of webinars and integrates slide navigation (which can be disabled) and the ability to offer a carousel view of similar views and webinars held within your system. Mesh meanwhile is a simple drag-&-drop solution that lets you quickly and easily create work by dragging and dropping selected clips into the timeline. The created work must then have metadata created by the user before being uploaded into the system for review. VF Hub also lets you collaborate on clips using built-in tools that enable multiple users to review and comment on any video asset added to the VF Hub Media Library. These include Spatial, Temporal or Voice interactive marker tools to make the range and nature of comments as flexible as possible. These markers can also be exported into various formats (XML, CSV, PDF) and/or exported into editing software such as Premiere Pro. We’ve developed this software to be a flexible solution with which you can ingest, manage, review, comment and archive your precious video assets for use in current and future projects. The system is great for video blogging, online webinar creations but is also sufficiently powerful to be a handy resource for larger projects and company wide video asset management. If you’d like to find out more about VF Hub, please contact us. What’s the business case for Google’s Chromecast? Google’s new content streaming product Chromecast is high on the tech news agenda at the moment. This cheap gadget should let you stream content from a computer running Chrome, iOS or Android device and is expected to give Google a stake in a market for streaming devices that’s currently dominated by consoles, Apple and Roku. Yet more evidence consumers are driving change in the way broadcasting works comes in the latest Infonetics research reports that claim Pay TV incumbents are losing subscribers to new IPTV services in Brazil, Russia and Europe, even while Apple now offers the world’s most popular streaming TV solution, Apple TV. 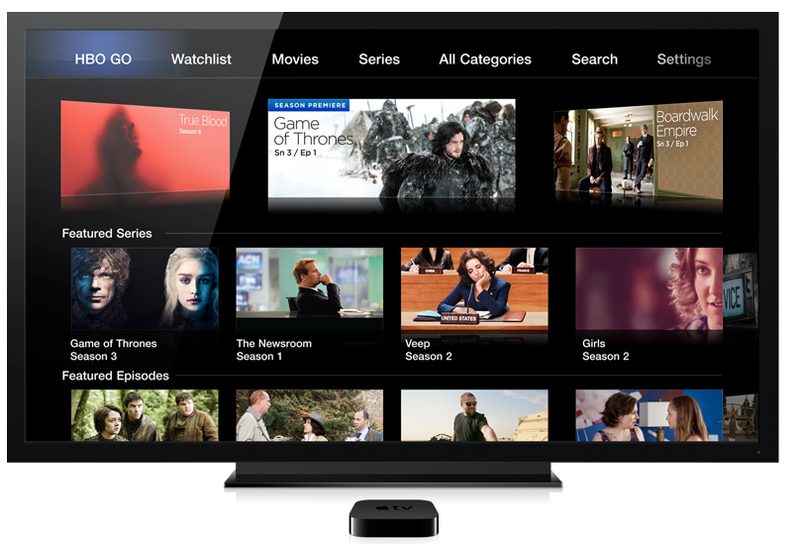 Yet more evidence of an app future for television as Apple approaches a deal to offer Time Warner TV shows via the Apple TV and recruits new talent to lead negotiations with media and cable companies in order to widen what it offers via its set top box. Meanwhile at the opposite end of the ring, Samsung has acquired intelligent TV pioneer, Boxee. The disruption of broadcasting starts with an app, not a whimper, at least that’s how it seems as channels choose to offer up their programming on mobile devices using apps, a trend begun with the BBC’s widely used iPlayer app. WWDC 2013: Apple has made a big bid to regain its faithful in the pro markets, previewing the next model of its Mac Pro and promising a future version of Final Cut Pro X will include the capacity to work with 4K video content when it ships later this year.